It is formulaic and predictable but it has some good performances by its cast. It might be better if it wasn't so nostalgic and actually played its racial themes more than in the most superficial way possible. Still, I think it might be the best football movie ever made. Not bad as far as sports dramas go. More a movie focusing on racial integration than a sports movie, which is a good thing because it excels at the former and is lacking in the latter. 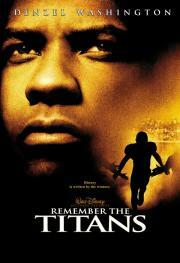 Personally, I don't have a whole lot of love for sports movies, but this one has much more to offer than football. If you can roll through the cliche's in this one without faze, then you're going to have a great watch.